Description: NS 2597 leads a scarred NS 8427 and ex-Conrail NS 6743 west through Leetsdale. 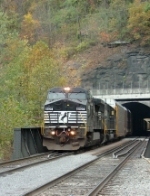 Description: NS 143 approaches the CSX diamond at Milford Jct. Description: NS 143 is southbound at Milford Jct. in the late afternoon. Description: NS 143 passes the signal at MP 17 just North of Leesburg on the Marion Branch. Description: NS 143 passes mp 17 just north of Leesburg on the Marion Branch. Description: A gang of NS units and one lone UP get some R&R at the Landers Yard engine facility. 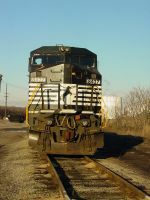 Description: NS C40-8W 8427 in need of a paint job at Columbus, Ga. Description: D&H 168 grinds uphill atCrocker Hill Road in Port Crane. Description: 168 continues up Belden Hill parallel to Route 7 with light snow falling. Description: 168 rounds the bend in Sanitaria Springs. You'd never know there was a monster intermodal train behind the leader, would you? Description: 168 nears the peak of the slope, passing an abandoned gantry signal at Moot Town Road. Description: CP 168 approaches Tunnel Road. Description: 168 approaches Pratt Road in Fenton, NY. Description: 168, with the toasted toaster howls past Pratt Road in Fenton, NY. Description: 168 soars over the landmark D&H trestle in Harpursville, NY. Description: 311 heading onto the wye at CP 79. Description: 311 on the Redkey Running Track. Description: NS #322 chugs upgrade south of Flovilla, GA in a torrential downpour. Description: Southbound autorack roll through Hemphill Tunnel #2 on the Pokey. Description: Here's a look at the Leslie RS3L on NS 8427. Notice the right horn cover should be blue but the soot has turned it black. Description: NS HC42 flat switching cars in the Croxton New Yard with former Conrail Dash 8-40CWs and GP38-2. Description: Looks like 8427 has seen better days as it smokes its way east with a roadrailer. Description: NS Southbound Intermodal Train 223 ( Kansas City, Mo. to Atlanta, Ga. ) passing through Control Point Hair in Dalton, Ga. Description: NS Alabama train 21R is seen as it starts it's trip at 11:02. Here the train is seen passing the control point of Bolton crossing over from two to one from the "Old Way"